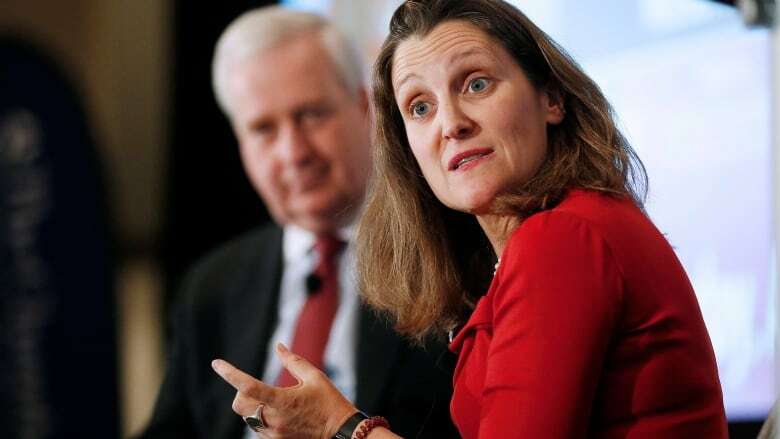 Canada's Foreign Affairs Minister Chrystia Freeland said NAFTA renegotiation talks have reached a critical juncture and she's hopeful a meeting with U.S. Trade Representative Robert Lighthizer in D.C. this week will offer the push needed to secure a "win-win" deal for all sides. As China and the U.S. are locked in a tense standoff over tariffs, Canada's Foreign Affairs Minister Chrystia Freeland said today NAFTA renegotiation talks have reached a critical juncture — and she's hoping a meeting with U.S. Trade Representative Robert Lighthizer in D.C. this week will be the push that secures a "win-win" deal for all sides. Freeland, speaking at a luncheon hosted by the Winnipeg Chamber of Commerce, was reluctant to shed much light on the specifics of the late-stage trade talks, but said securing an agreement on the "fiendishly complex" rules of origin for autos last month was a welcome development as NAFTA renegotiations came down to the wire. Last month, U.S. negotiators dropped a demand that all vehicles made in Canada and Mexico bound for the U.S. market contain at least 50 per cent American-made components. "We're getting to what I hope is quite a decisive moment in the negotiations," Freeland said. "As you have been reading, I think that we are making some good progress. "We made progress on rules of origins for autos, which, in my view, is both the most fiendishly complex part of the negotiation but also the heart of it. The fact that we were able to make some progress is promising." Sources have told CBC News the Americans are eager to sign an agreement in principle on NAFTA next week in Peru, where the leaders of the three NAFTA nations — U.S. President Donald Trump, Prime Minister Justin Trudeau and Mexican President Enrique Peña Nieto — will be attending the Summit of the Americas. The final details of a deal could then be hammered out by negotiators at a planned meeting in Washington, although the details of this round of talks have not yet been finalized. Under that timeline, a new NAFTA deal could be presented to U.S. lawmakers in Congress before new representatives take office next January following mid-term elections. U.S. trade law requires a six-month consultation period with congressional committees before a final vote on a ratified NAFTA. There are fears the new Congress could be awash in progressive, and protectionist, legislators who might be less likely to a sign a new trade deal — the fallout of an anti-Trump wave that could sweep many pro-trade Republicans out of office in the November midterms. Speaking in Toronto Wednesday, U.S. Ambassador to Canada Kelly Knight Craft also sounded a positive note when speaking about the trade deal. "I'm confident we will get a deal that everyone feels good about," she said. "I've yet to meet a Canadian who thinks the 23-year-old agreement is perfect. It's like a solid house, it needs to be updated to reflect the 21st century standards and realities, but there's no reason to tear it down." Sarah Huckabee Sanders, the White House press secretary, told reporters Wednesday the three parties have made "significant progress" on a final deal. Mexico's Economy Minister Ildefonso Guajardo was holding talks with Lighthizer in Washington on Wednesday ahead of a planned trilateral meeting that will include Freeland, the Mexican government said in a statement. At the same time, it added, Mexico's Foreign Minister Luis Videgaray will be in Washington to meet President Trump's son-in-law and adviser Jared Kushner. Moises Kalach, a senior member of the CCE business lobby — which represents Mexico's private sector in the talks to revise NAFTA — said he expects signs of progress even if ministers do not reach a formal agreement. The United States "is in more of a rush than before ... the window of opportunity is now open. It's a couple of weeks," Kalach said on Mexican television. "We expect that between two to three weeks ... there is a process so that there is a chance to close."